Good day Finland Trackers! I have not forgotten you. Here is a start in a series of article that I will write reference Human Tracking and Anti-Tracking. I hope that you enjoyed the last article on Anti-Tracking. This coming year until April of 2015, I will be basically writing a series of article on the “How to of Tracking”. 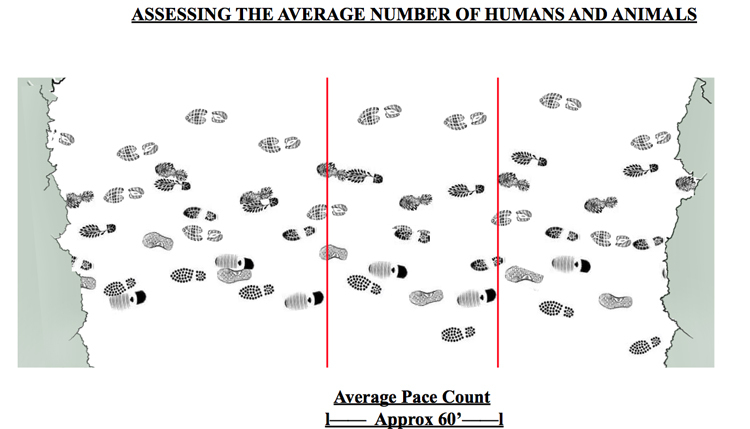 So, having said this, how is it that we can assess the approximate number of humans and animals in a given area? NOTE: Basically the stride of the average adult is pretty much the same. The stride, and as a direct result the pace, will vary in length based on terrain, weather, weight, walking up hill or downhill, physical and psychological condition, and height of the person(s) in question. (child compare to an adult). We will continue this tracking how to “ASSESSING THE AVERAGE NUMBER OF HUMANS AND ANIMALS” this coming September. So, until we track again in September keep training. In September we will discuss the Comparison Method of assessing the approximate number of humans and animals in a given area. My Anti-Tracking book will be out in the Spring or Summer of 2015.